My son, aged 6, is not yet speaking. Doctors think he is on autism spectrum based on the autistic-like characteristics he presents. He had 10 single words by 18 months and then he made no gains at all in his speech. His other delays include difficulty in sensory modulation and regulation, both fine and gross motor delays, and lacking age-appropriate play and social skills. 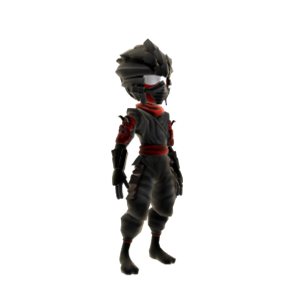 He is a very friendly child and loves to socialize but does not know how, until I started him on BAC. He has been on F3 since December 2011 and in that short span of time his school staff and I have both seen some startling positive changes. He is making a lot of sounds and vocalizing throughout the day. He is more aware of his surroundings; he is initiating more interaction with his peers and staff; he has become very good in using his communication book with at least 30 pictures on a single page; his responses to directives and commands have become quicker; his comprehension has improved dramatically and can follow 2-3 step directions; he is very eager to learn new things and learns fast. Anytime he catches a cold it would turn into a lung infection in a matter of days, but now he had a cold and it did not affect his lungs and he was able to fight the cold; he would startle at least 3-4 times daily at the time of going into deeper sleep but not anymore. Not since he started bio-algae. Overall, there is a big change in his personality and his socialization skills are also improving. He has gained weight and height and last May when he had his routine blood work he showed signs of a thyroid problem. This April when he had his blood work done again his thyroid levels were within normal range. BAC is truly a miracle food and I am looking forward to seeing more improvements. In part I, I wrote about diseases, medications, supplements, and their statistics. I wrote about how our medical systems, whether conventional or alternative, tend to work allopathically rather than holistically. 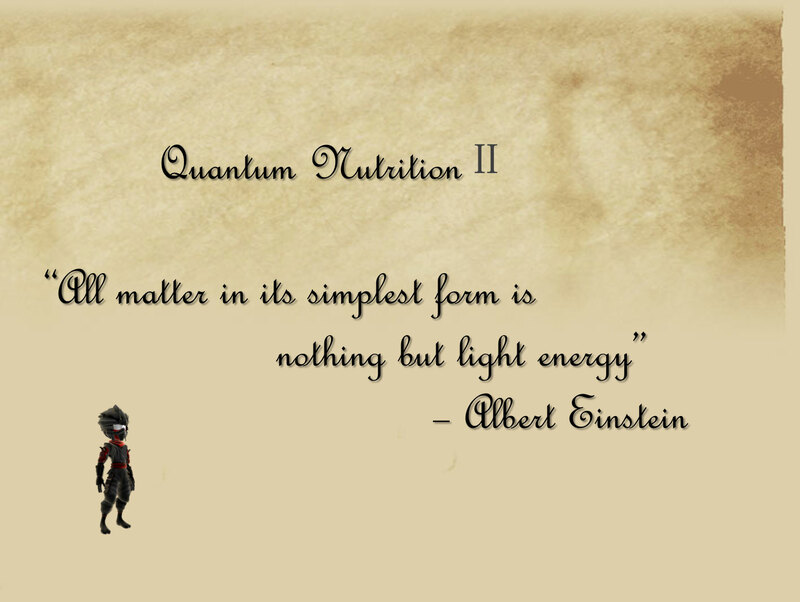 The following image is a quote by Albert Einstein that gives you a clue as to the topic of part II. I will talk specifically about two types of energy with which we maintain our physical life-force. What is so wrong with our medical models? Before I start talking about energy, let me remind you about what I believe is wrong with our medical models. It is a money-driven insurance-based disease model rather than a wellness model based on prevention. A picture, such as this one, tells a thousand words. This image supports the statistical fact that the leading preventable cause of disease is diet. 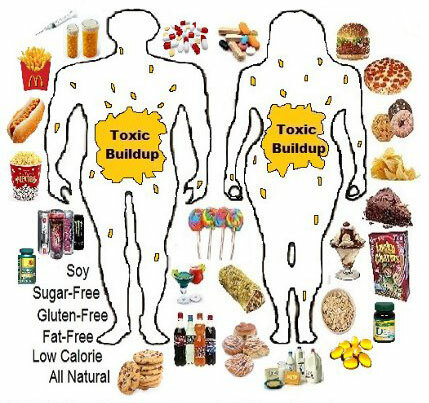 We bombard our body with toxic food for decades, then blame our genes when we get sick. 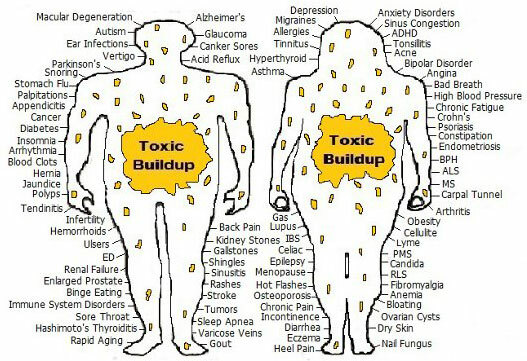 Toxic buildup is to be blamed for most symptoms. We are accepting the allopathic view that treats symptoms and diseases, which are rarely the root of the problem. Toxic buildup and neglect is to be blamed for most symptoms. There are thousands of symptoms and each is given a name, and soon a drug can be prescribed to that symptom. Each year, new symptoms are given names and new drugs are prescribed. But in most cases, these symptoms are reactions to pain, discomfort, and detoriation due to toxic buildup and neglect. Surely, not all known symptoms are shown in this image as there are now thousands of registered symptoms and diseases, and associated drugs. And certainly people are not taught this, as the entire medical establishment and its schools do not teach this; its students rarely get more than a couple of hours of nutrition studies. I believe that another big part of the illusion created by our disease-based model starts when looking at this kind of limiting drawing of our human anatomy. 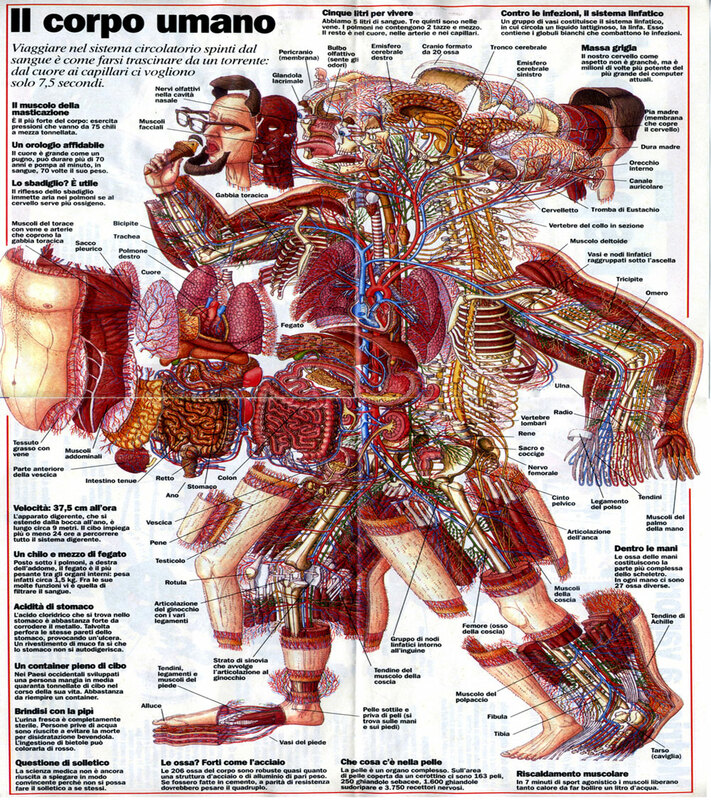 Here, an artist under the guidance of a physician painstakingly drew this rendition of our anatomy, attempting to represent skin, tissues, muscles, organs, bones, and many of our blood vessels and nerves. There are at least 5,000 anatomical parts here. What about our endocrine glands? What about the thousands of miles of smaller blood vessels, nerves, lymphatic conduits and hundreds, if not thousands of lymph nodes in our body? What about our 100 trillion cells and their trillions of molecules and atoms? 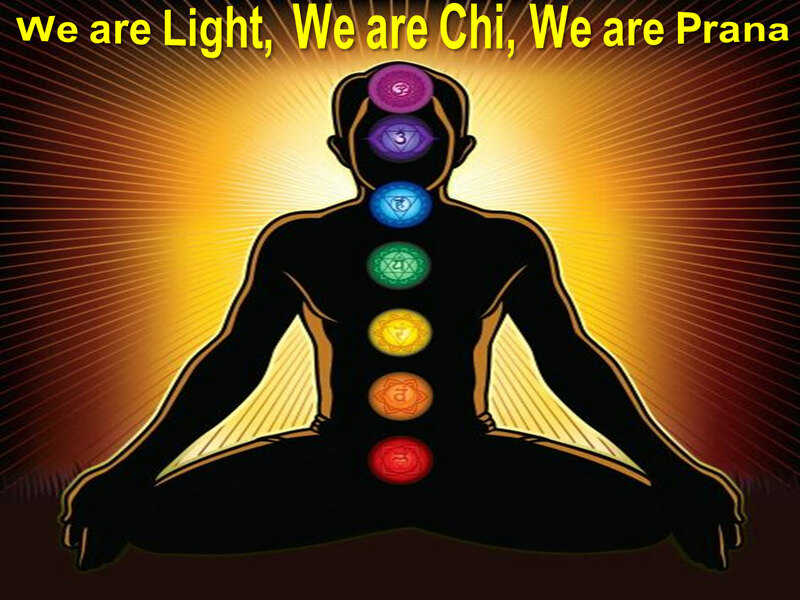 What about the fact that we are none of the above, but that we are energy, we are light, we are prana, we are chi? Why is that not a discussion within our medical systems? This has been known for thousands of years, and certainly in this last century with our current science we know better. Maybe those in charge of the drawing ran out of space. Then some regulating body must have said “That being that, let us practice medicine with what we can draw.” And to this day, in most cases, our conventional and alternative medicine practitioners continue to practice preventative and disease-based medicine with this type of anatomic description and discussion. For the advances in emergency and surgical medicine of today we should be grateful, but why is it that when it comes to disease-based medicines we refuse to work with reality? There is endless ignorance, neglect, abuse and error when treating humans as a collection of parts and systems just like mechanics do with our cars. Similar to cars, brake fluid and oil pressure, we are subjected to checkups and diagnoses of all sorts: blood pressure or blood sugar levels, eye pressure, EKG, MRI, X-Ray, etc. Then we have procedures and treatments like liver flushes, colonoscopies and colonics. We are offered thousands of medications, herbs and supplements for thousands of potential diagnoses, for blood pressure, prostate, cholesterol, hormones, thyroid, skin, hair, for all organs, for digestion, for elimination, etc. Hundreds of years after science knew the Earth to be a sphere, certain religions and schools continued teaching on the basis that the Earth was flat. Today, science knows that all is made up of atoms and sub-atomic particles. We know that unlike last year’s model of a car, our human body is billion of years in the making. Even staying on the three dimensional level, we know that you and I are not separate; we are atoms bathing in an energy like soup, just like fish in the ocean. But unlike fish, we humans have the opportunity to be aware of what we are. We are born from the encounter of two specialized cells. 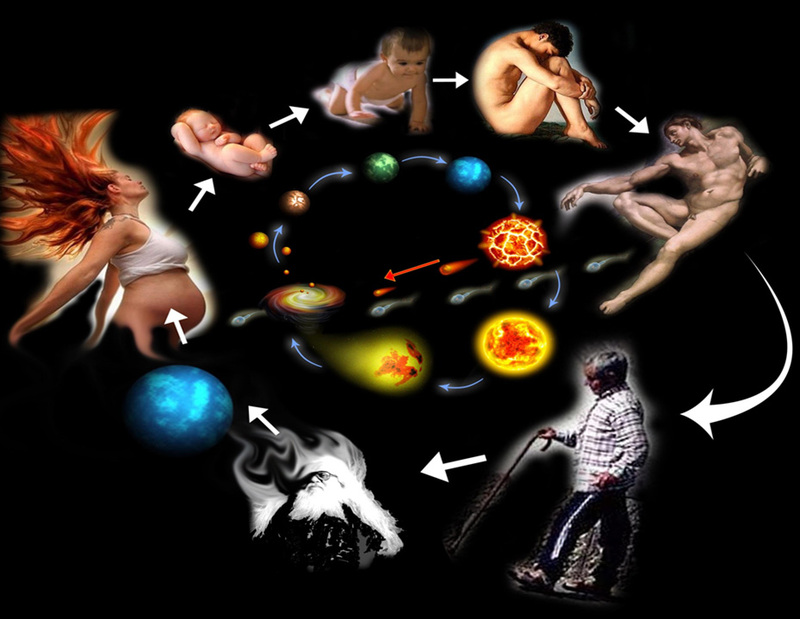 The sperm fertilizes the egg, and in that moment we are called a zygote. For a while after that our zygote keeps on splitting to form two, then four, then eight, then 16 and so forth until an apparent human shape forms. Now we are given a name: fetus. We are something tangible to work with, something that can be seen… phew! And because of that, we now ignore the fact that we are still only but cells, a conglomeration of millions of them that kept on splitting, growing, regenerating and intelligently working together to become you. We now think that we don’t have to deal with these microscopic cells, for now we are on the radar. The doctor can see and work with something tangible that can be examined with an MRI or felt with the hands and treated with current crude methods. Don’t you see the tricks we human play on ourselves? Even if the previous image showed only a few spermatozoid cells, let us imagine our truer, more realistic human anatomy that is made up of ~100 trillion cells. I know that you will agree with me that we should not deny their existence just because we cannot see them. The human / car comparison ends here. Who has not heard expressions comparing human anatomy to that of a car when dealing with health? Many such expressions are commonly used: go in for a checkup, oil change, a liver flush, maintenance, detail cleanup, a cleansing cure, blood sugar level, brake fluid, etc. After a lifetime of hearing those expressions, we believe them. We think of ourselves as parts and systems, and we think of doctors as mechanics. We agree to annual checkups. We agree to let people take our blood and then give us a diagnosis. We live our life believing that when we are broken, someone will be there to fix us. We think of the hospital as a garage. The human / car resemblance stops here. The average car has ~14,000 parts and no life, that’s it! We have ~100 trillion living cells, and that is just the beginning. While car parts are inorganic, non-living objects, each of our cells are organic living organisms further made up of thousands of organelles and trillions of molecules. Did you know that each cell in your body contains on average 2,000 mitochondria, the engines within the cell that fabricate energy? 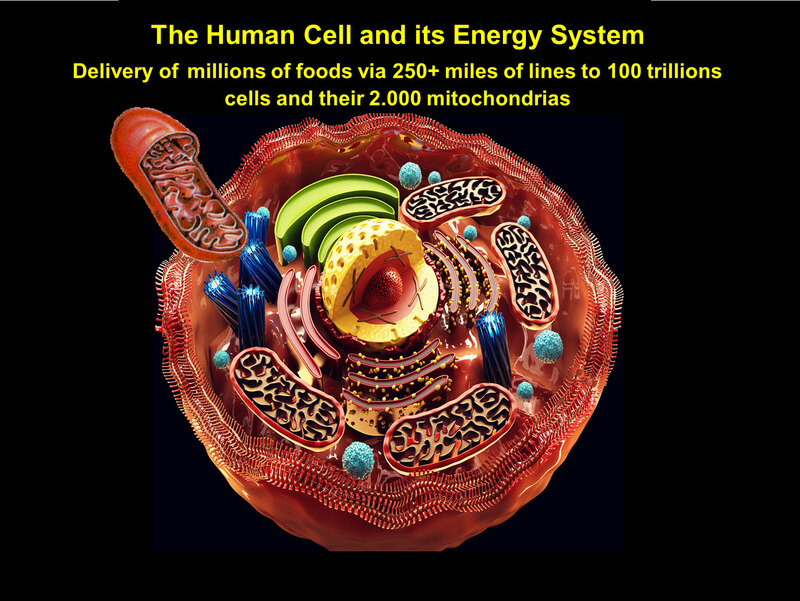 Did you know that we have over 250 miles of cardiovascular conduits that bring our food/fuel to these mitochondria? Compared with a car with one engine and 15 feet of gas conduits, the human cell is infinitely more complex. Knowing this, where do you think medicine should go? Since the cell is the undeniable unifying element of our 3D existence, doesn’t it make sense to practice medicine at this cellular level? What? Did I say something wrong? Or is it that thinking that we cannot control anything at the cellular level, we have decided to practice at the level that we can see, touch and seemingly control? We will revisit this later. We now know that the thousands of organelles in our cells are made up of over 20 trillion molecules. Doing the math we get: 20 trillion molecules times 100 trillion cells for a total of 2,000 trillion molecules in our body, a vastly different and truer reality then the blood and guts that our physicians are comfortable working with. 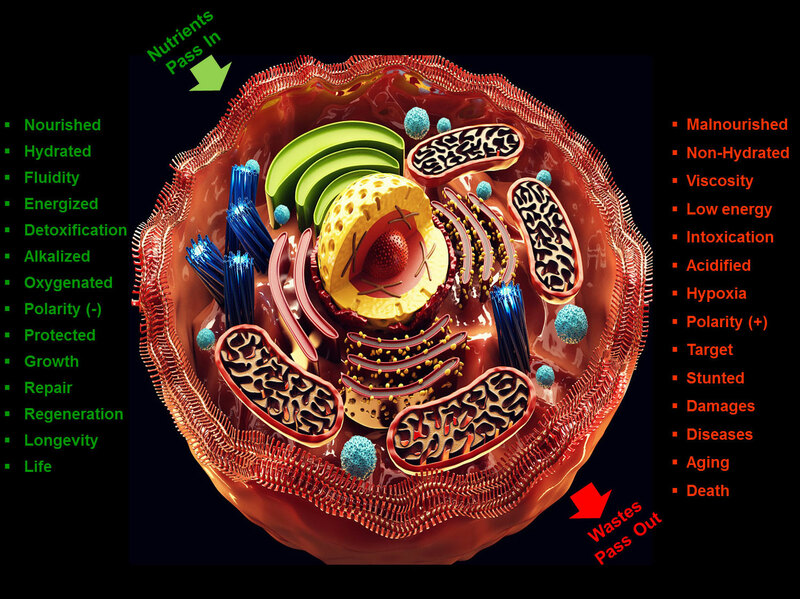 Knowing our cellular makeup, shouldn’t we practice medicine at this level? In the last century, when we finally identified the cells of our body, we thought that we had the answer. Then just a few decades later, we discovered the atom and were amazed, and then not so long ago we identified quarks or sub-atomic particles. Some limiting individuals claim that it is the smallest particle that we will ever find, but the discussion about sub-quark particles has already begun. In the meantime, we now calculate that every cell in our body contains approximately 200 trillion atoms, 100 times more than the 200 billion stars in our Milky Way! 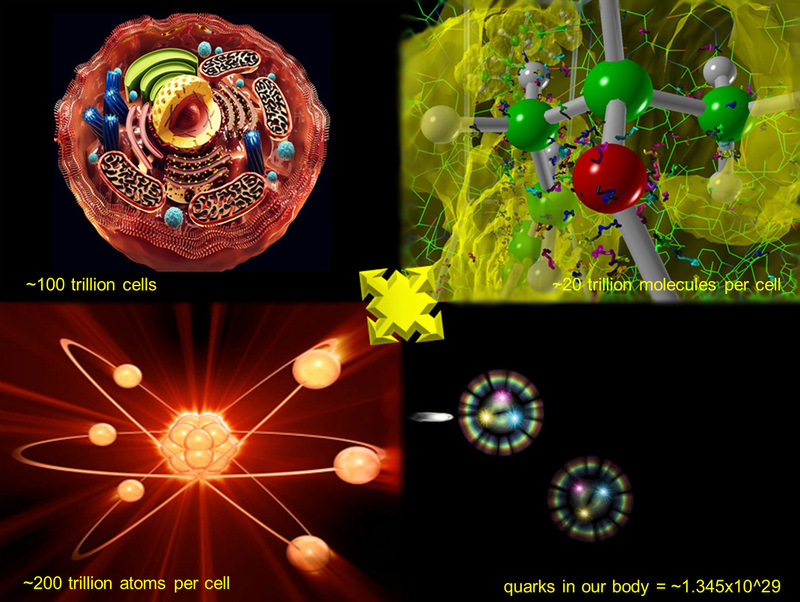 We also know that there are 3 quarks in every proton and every neutron of every atom in our body, totalling ~1.345×10^29 quarks, a very approximate number of quarks in our body. I hope that like me, you realize that our reality is astronomically impossible to conceive. With this knowledge about our human makeup, would it make sense to practice medicine at the quark level? Or do we agree to keep on practicing medicine for the liver or pancreas because we cannot control anything at the cellular, or molecular, or atomic, or sub-atomic levels? We are nothing but energy, chi, prana! While our medical systems and practitioners are stuck within the collective agreement of the Newtonian blood and guts model, it is now universally known that we are energy beings. Without a shadow of a doubt we know that we are light, chi, prana, that we are spiritual beings having an apparent physical human experience. Interestingly, did you know that 2,500 years ago, the Buddha already taught that we were blinded by our limiting senses, that with our eyes we can only see large, that with our touch we can only feel surfaces, and that our intellect is limiting when believing our senses. By now I hope you understand your energy body, and have a greater sense of respect as to its likely role. Is our physical body to neglect, to destroy? Or maybe it is to carry our consciousness through this human experience. For our body is surely a temple like the catholic priests used to say at church. With this said, I hope you understand that our current disease and medicine based models are out to lunch. It is time that we look at a fresh model for wellness. One where the meaning of words is found again. One where the word “doctor” means teacher, its true meaning, and not M.D. as in medicine dispenser, whether they be drugs or supplements. One where the word “medicine” means to mediate, it’s true meaning, and not medication. The time has come to agree that conventional and alternative natural medicines, those that practice allopathic dispensing of drugs or supplements, are mostly wrong. 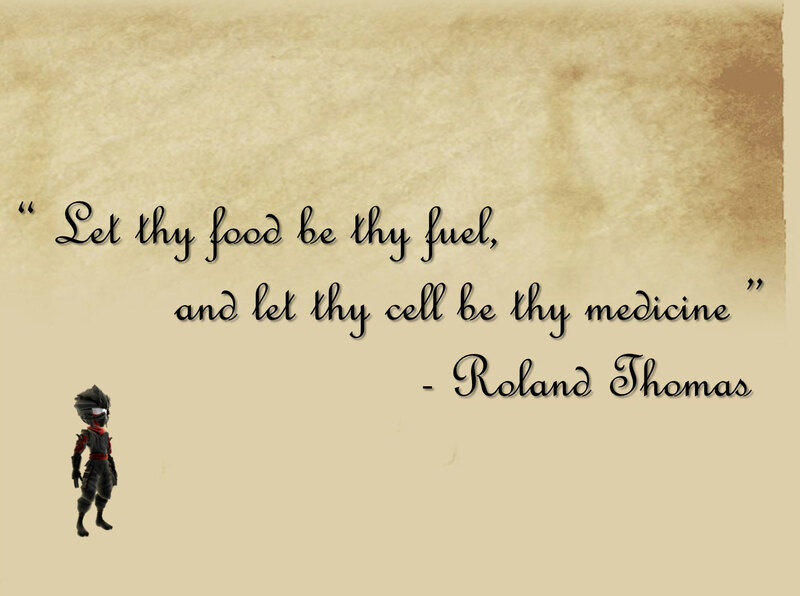 We will be looking at food not as a medicine, but as fuel with which our cells derive energy. We will see that with energy our cells can carry on doing what they do best; grow, repair, protect themselves, self medicate and cleanse. We will think in terms of doctor as “teacher” providing knowledge and information, rather than as “know it all” providing medication. We will learn that we live off the energy that our cells derive from the foods that we eat. We will know without a doubt that food is not medicine, and that food is primarily a fuel for our cells to produce energy from. We will look at medicine within where 100 trillion powerful cells are the medicine. 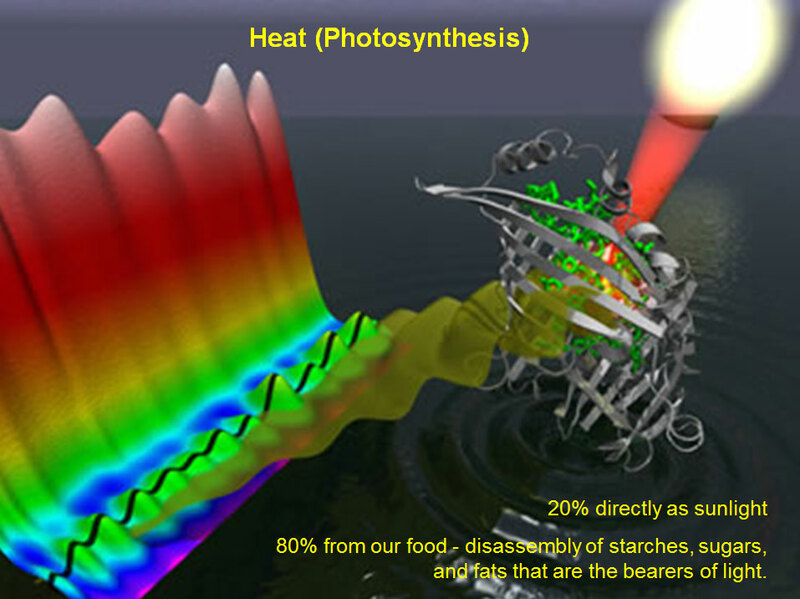 Most of you have heard the word photosynthesis and learned in primary school that plants produce energy from the sun. Well it is true, but I don’t think that you realize that it is the MOST important thing that you need to know about food and your energy. 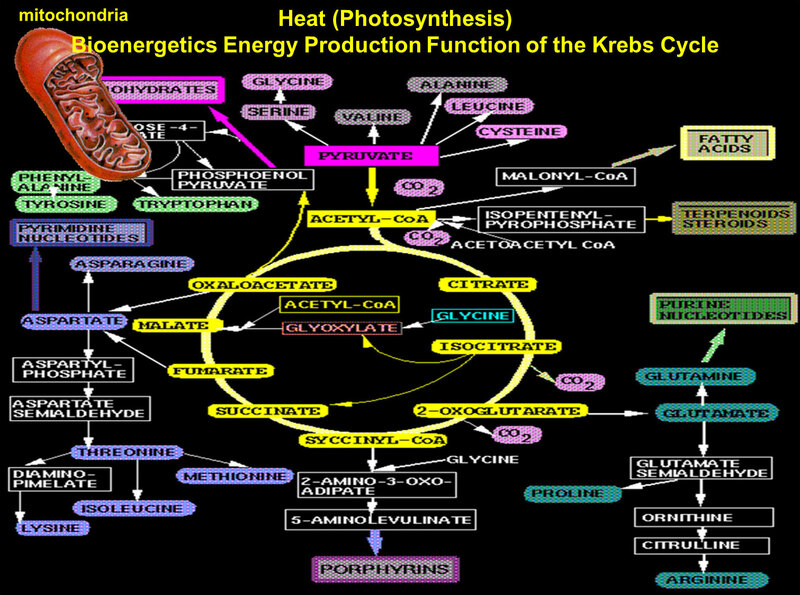 This picture demonstrates simply the metabolism of the Krebs cycle producing ATP energy. This valiant effort by an artist is but a glimpse of the complexity of the biochemical activity taking place in 2000 mitochondria in each of 100 trillion cells of your body. With the details that chemists know today, to truly represent the complexity of the Krebs cycle would take many more charts. And know that we keep on discovering more details with newer microscopes. 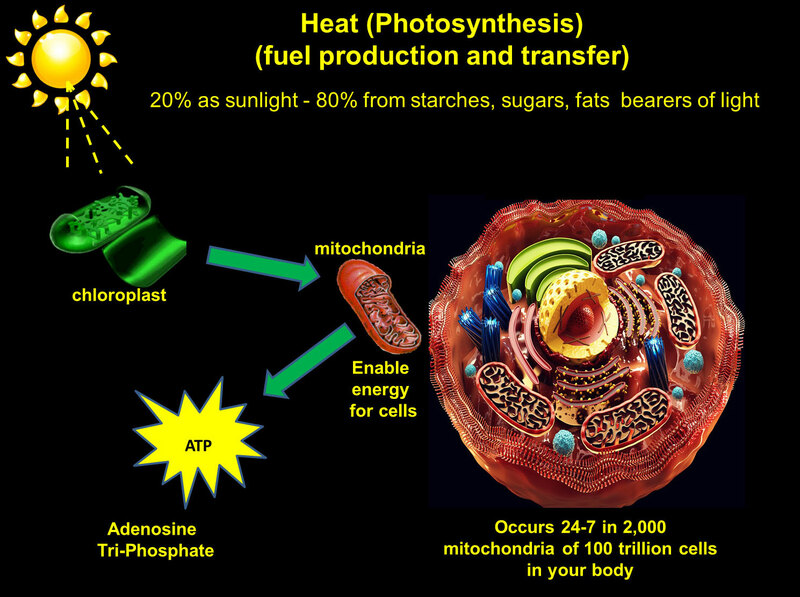 Try to imagine that you eat to feed 2000 mitochondria in each of the 100 trillion cells of your body, that is 200,000 trillion engines not just ONE like the car. So folks, remember this picture and the fact that “it’s not about medicine, it’s about energy”, and don’t let anyone compare you to a car ever again. Don’t let anybody tell you a grand story that their medicine can reach your mitochondria and fix them, or make them function better. Be smart, and know that the best way to help the wellness of your cells is to bring in good quality food/fuel. Have no doubt that whole fresh foods, mostly plants are the best fuel for your cells. The second form of energy that we need to fuel our body with is called “strong” energy. It is the force that holds the atom (nucleus, proton, and electron) in place, and that can be mighty like nuclear energy. 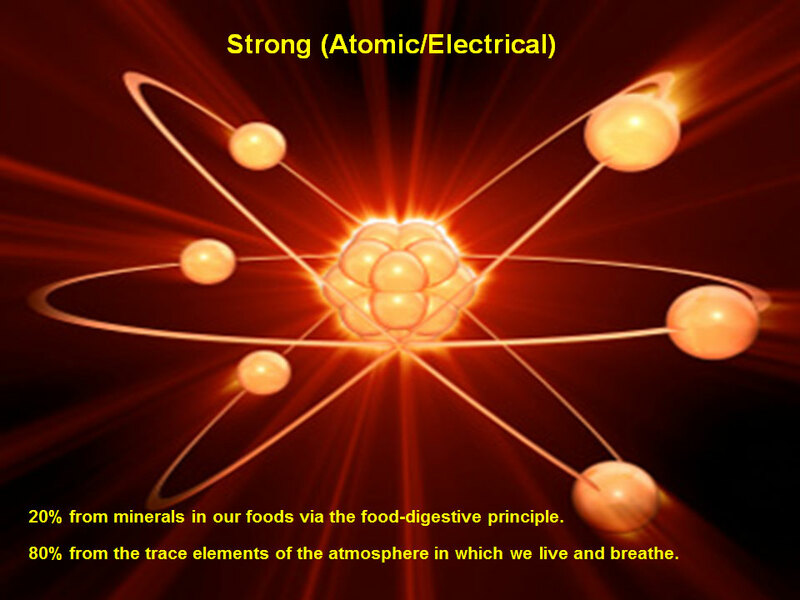 The strong energy is the basic atomic energy found in molecules of minerals and trace elements of all physical life. For example a rock is perfectly happy and full of energy due to its atoms. Its electrons and protons and quarks are busy traveling at the speed of light, even across the universe as we speak! And our human body is pure energy too. Now mind you that due to our judging conscious/mind or loss of energetic coherence we may or may not feel so energized. This atomic strong energy is in the food that you eat and the air that you breathe right here right now! It is after entering our body via our lungs or digestive system and reaching our blood that it is assimilated and absorbed within our cells in order to replenish lost energy and regain life-force. You are all somewhat familiar with the old classic periodic table of elements with 33 elements in its first publication in 1789, then as we identified minerals and elements it became 49, then 80, 103, etc., and as of 2012, we have identified 118. As we continue to identify smaller elements, it will grow ad infinitum, YET scientists and chemists swore, just like they swore that the Earth was flat, that there were only 33 elements, until it was revised to 103, etc. I really like this non-linear table by Philip Stewart. He says that at an early age he did not want to choose between the arts and the sciences. His special interest is in the way that peoples’ beliefs affect how they interact with natural systems. Chemistry has always fascinated him in linking the vast world of stars and galaxies to the utterly minute world of the atoms and molecules of our living planet. One of the benefits of this table is that it leaves room for infinitum. It is open rather than closed. We know that energy is found in the movement of the sub-atomic particles “electrons” and “positrons”, and that each element has its own unique vibratory pattern called “frequency”. 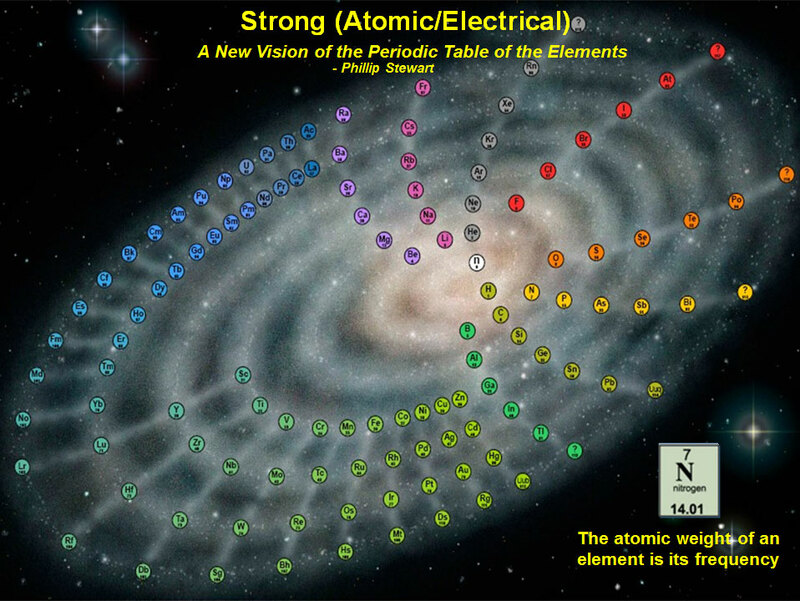 In summary, we know that the atomic weight of an element as represented in the periodic table is its frequency. According to the research and writings of Dr. Reams, when the frequencies of two different elements are brought together, they form a new compound with a higher frequency. And so the more complex the molecular form the higher the frequency. At the top there is “human”. I bring this up so that you can grasp the close relationship between mineral / element frequency and our human frequency / energy. That’s all! In a book by his student A.F. 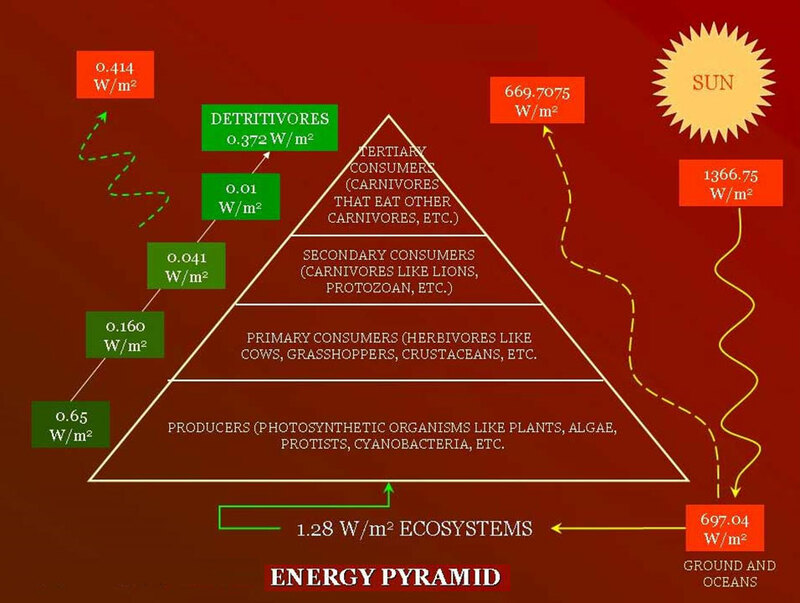 Beddoe, BIOLOGICAL IONIZATION AS APPLIED TO HUMAN NUTRITION, there is extraordinary information on the relationship between food, nutrition, energy and frequency. In one of the texts there is a wonderful description of digestion that you will never find in our school systems and that should be there of course. It says “foods are broken down to churn by digestive acids and enzymes in the stomach, then further broken down by digestive enzymes in the early intestine to be assimilated as molecules and directed to the liver for further disassembly and re-organization into human level frequency, then stocked or released to the blood towards the lungs and the heart for distribution.” The text goes on describing how the more subtle and so small trace elements will bypass normal digestion traveling within the body via other channels wherever their weight and electromagnetic frequencies will take them. Hence playing a role in the overall balance of our energy and frequency. Look at this artist’s rendition of a cell and tell me where medicine can intervene. Imagine that it would take a thousand images to barely begin to represent the hundred thousand organelles of your cells. Those organelles are each industries producing millions of enzymes, co-enzymes, proteins, and other bio-chemical factors and co-factors needed by your cells and their environment. It would take hundreds of charts to represent the formidable and most intelligent membrane of the cell with its thousands of receptors and effectors, the homeland security, the central intelligence of your cells. Knowing this, why would you consider taking drugs or supplements, or anything else than whole food? Do you really think that drugs and supplements that did not exist 100 years ago are going to overwrite the 3.5 billion years that it took to make humans the most complex organisms on the planet, and our food the most perfect way to obtain our energy? Stay tuned for next month’s Quantum Nutrition III – Life-Changing Efficiency Principles.